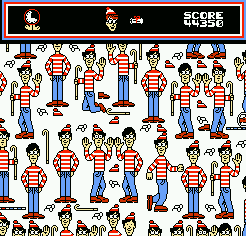 The Great Waldo Search is a hide-and-seek game that was also released on the Super Nintendo (1992). Each level is timed and the objective is to locate Waldo and a missing magic scroll belonging to the wizard Whitebeard; the faster you do so, the higher your score is. The three modes are Normal (five levels), Expert (five levels) and a Super Waldo Challenge (single level). Normal is extremely easy as Waldo is always in clear view; it's obviously aimed at young children but the gameplay is so undemanding that there's really no reward for your efforts. Even if you make a mistake and click the wrong icon you're not penalised in any way! Locating Waldo's canine companion Woof allows you to take part in a side-scrolling mini-game where you try to collect as many blue icons as possible for extra points. The controls are fine but the action is basic and the icons are always in the exact same places. Expert mode attempts to 'up' the difficulty by obscuring part of Waldo behind the scenery; it might take you a few seconds longer to beat but it's still a breeze. This mode also features a bonus task if you find two clocks, as the game stops and you need to use a clue to locate the right person from the background. It's utterly pointless and a throwaway idea to add some semblance of variety. These two modes make up the majority of the game's content but they can each be fully beaten in around five minutes; this is completely unacceptable and there's no reason why each mode didn't have 4-5 times the amount of levels! The Super Waldo Challenge tasks you with finding the version of Waldo that's not wearing any shoes; there's really no point, as you basically repeat the same thing five times with no scenic variance. The Great Waldo Search could have been a mildly entertaining hide and seek game for kids, but the execution is lacklustre and the minimal amount of content is disgraceful. There's literally nothing to do after the first ten minutes of play, and anyone who bought this new back in 1992 was the unfortunate victim of daylight robbery! Random trivia: Another game in series called Where's Waldo? was released on the NES in 1991.